I made a small version in a wee skillet - you could do this too, or cook the caramel and apples and divide it among tart tins, then cover each with a drape of pastry. 2Preheat the oven to 400°. Stem and halve your crabapples; if you like, cut out their cores. 3In a heavy ovenproof or cast iron skillet cook the sugar, butter and honey over medium-high heat for 4-5 minutes, until it turns smooth and golden. Place enough apples to cover the bottom of the pan into the hot caramel and cook for another 2-3 minutes. (Pack them tightly - they'll shrink.) Remove from heat and turn the apples cut-side up using tongs. 4Roll the pastry out until it’s a little larger in diameter than the skillet(s); cover the apples and tuck in the edge of the pastry. Cut a few slits in the top and bake for 20-25 minutes, until the pastry is golden and the apples bubble around the edges. 5Carefully invert the tarte tatin onto a plate while it’s still warm. 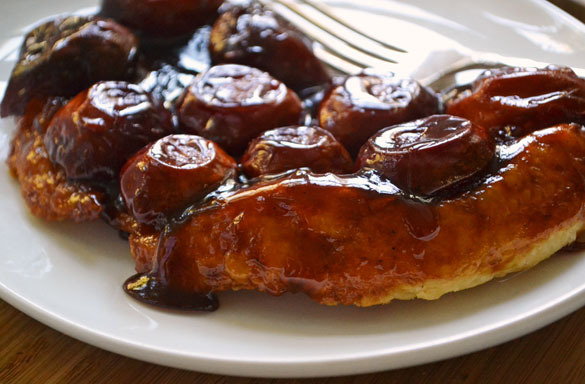 Serve with whipped cream sweetened with maple syrup.